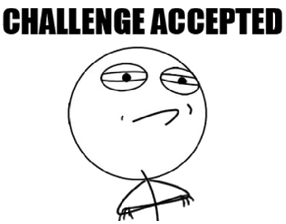 Escape from the relegation zone with two weeks left? Truly a mixed bag, as the cliche goes. A last minute penalty rescued a point for Habay in a game we threw away, but then a last minute winner on Saturday earned us the three points after we threw away a 2-1 lead. 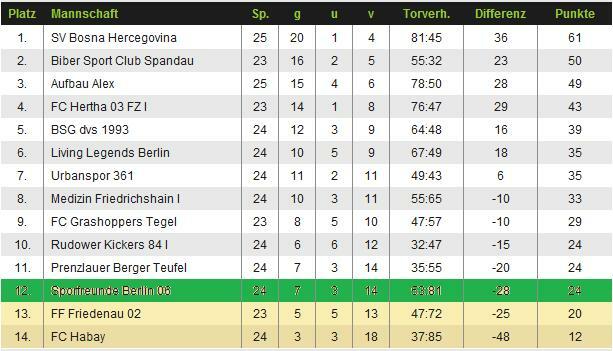 Sportfreunde Berlin in the last relegation place. Yesterday. Realistically, Grasshoppers are safe. And Habay are down (thankfully). So that leaves four of us fighting to avoid two relegation places. Friedenau have a game in hand, but are four points behind. We have the worst goal difference (not the replacement goalkeeper’s fault, I heard…) which means we need a point on top of whatever Rudow and/or Prenzlauer Berg get to finish ahead of them. It looks like it will all go down to the wire, on Berlin Freizeitliga Survival Sunday (which is actually on a Saturday. Hmm. Might have to rethink the marketing strategy for that one). And as the other teams around us kick off later that day, it will involve either a trip to watch their games after ours, or furiously hitting refresh on the league’s website after our match. After the reorganisation of the leagues last season, in which we won one of the two parallel second divisions, we were given a playoff game to win promotion to the new ‘Premier League’ of Berlin free-time football (not in the league pyramid), which we won. This meant we spent this season playing the best teams from the two parallel divisions we were under last season. And we have done quite well. We have thrown away points, like all football teams, but we have also won games we had no business winning. No one wants to get relegated. We love the challenge, and most of us would rather battle to a close loss than beat teams by 4 or 5 goals, which was often the case last season. On a more personal note, I have refused to shave since the Habay game until our season is decided either way. This is a constant reminder of the challenge ahead. My neck is getting really itchy, and I don’t mind admitting I look even more strange than usual (my beard is red with white hairs hidden amongst them), but I was happy not to have to shave after the Friedenau game, as anything less than the three points we eventually took would have effectively sent us down. Update: 6/6 – Rudow won against BSG 3-1, moving them up to 27 points. The task got a little bit harder now. Update 9/6 – Grasshoppers lost at home to Biber Spandau, and Prenzlauer Berg lost at home to Medizin Friedrichshain. This keeps Prenzlauer Berg level with us on points, from a game more, and drags Grasshoppers into the relegation battle. Grasshoppers still have to play Hertha Zehlendorf, and then their last game of the season is against Prenzlauer Berg. It’s getting tight at the bottom of the league. This entry was posted in General and tagged Berlin, Goalkeeper, Sportfreunde Berlin. Bookmark the permalink.